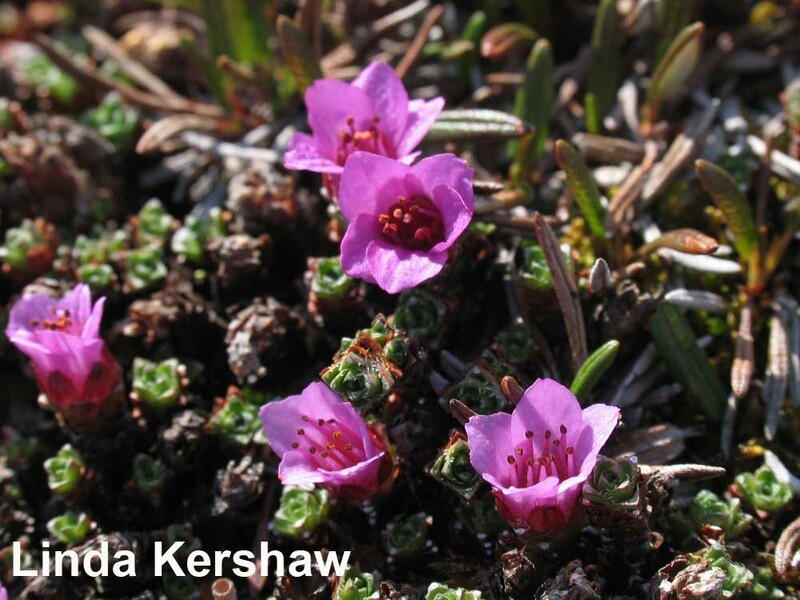 Saxifraga oppositifolia – In Canada’s North, the blooming of purple saxifrage coincides with calving in caibou herds. Contributing a splash of colour to otherwise rocky gray surroundings, this low, matted plant blooms with many beautiful lilac-coloured or magenta flowers. An arctic-alpine cushion plant, this perennial has many tiny, overlapping, gray-green, scale-like leaves, arranged in ranks of four. The leaves are only 2 mm – 4 mm (1/10 – 1/5 in.) long, but they completely cover the plant’s short stems. If you look closely with a hand lens, tiny rigid hairs can be seen at the leaf edges. The purple (rarely, white), star-shaped flowers are large, in comparison to the leaves (1 cm – 1.5 cm [1/5 - 3/5 in.]). They grow on short stalks, often in great profusion, above the cushion of leaves, with five sepals and five petals. Male and female flowering parts are purple like the petals, but when the anthers open, it’s easy to see the bright orange pollen. The fruit is a two-beaked capsule. The root system is extensive, with a main tap root about 50 cm (20 in.) long, and many side branches. Purple saxifrage is one of the earliest flowering plants in its arctic or alpine habitat (e.g. April in the mountains; June in the Arctic). It begins to flower very soon after the snow melts, often right beside a snow bank. The timing of flowering is dependent on the time of melting – the temperature increase following snowmelt triggers flowering. This plant can be found blooming in cool, shady spots as late as the end of July. Most of the flowers in a cushion or colony open at the same time. This plant is one of several species studied as part of the International Tundra Experiment (ITEX), which explores the impact of climate change on the growth, phenology and reproductive success of arctic plants. The greatest change in climate and plant response is predicted for high latitude areas. Purple saxifrage is a wide-ranging, arctic-alpine species found, in the European Arctic and in high mountains like the Alps and Pyrenees. In the Canadian North, it grows from the Yukon to Ellesmere Island and from northern Quebec to Newfoundland. It is also found in high alpine areas in British Columbia and Alberta. True to its Latin name (Saxifraga means rock-breaker) this plant occupies barren, exposed rock; damp crevices in cliffs; and moist, calcium-rich gravel in arctic and alpine environments. In the Arctic, it often grows on mobile surfaces such as scree slopes. Note the location of your site. Your plants should be marked so that they can be easily located throughout the season and in subsequent years. One simple way to mark purple saxifrage is to use a few of the small rocks found in the same area. ITEX recommends the following method of permanent marking: “Use soft steel or iron wire, about 1 mm [1/32 in.] diameter, 20 cm – 30 cm [8 - 12 in.] long. Form it into a U-shape, penetrate the soil with one end, some 5 cm [2 in.] from the plant centre, and push down to encircle parts of the root system. Push it out until it surfaces. Attach a soft aluminum embossable metal tag, and twist together the ends of the wire.” (Pp. 24, ITEX manual, 1996). If the site is regularly visited by other people, put up information signs, or conceal the tags so they do not attract attention. If vandalism is not a potential problem at the site, make the plant easier to find by hammering a piece of 15 mm (3/5 in.) diameter, white, plastic tubing (used for cables) into the ground about 25 cm (10 in.) from the tagged plant. Leave only 3 cm (1 1/4 in.) visible above ground. Make a detailed map of the site. If the map is accurate, the tags do not need to be very conspicuous. Paleobotanists suggest that purple saxifrage evolved in a high alpine region, so it was well adapted to spread successfully into the arctic. This plant has a very long life span. Its habit of growing low to the ground protects it against evaporation and abrasion by wind-driven sand or snow. The foliage is low and crowded, and living parts don’t project very high above the ground surface. Plants put out about two pairs of new leaves each growing season, so a dense cushion of this plant only 10 cm (4 in.) wide is probably many decades old. Purple saxifrage is also adapted to the very short growing season of arctic and alpine environments. The flowering buds overwinter in an advanced stage (ready for blooming), protected by the foliage. Once the snow cover melts, flowering occurs in about 5 -16 days. Individual flowers last about 12 days. The plant requires less than two months (about 54 days) from first flowering for seeds to ripen, and this timespan is even shorter if flowering starts later in the season. 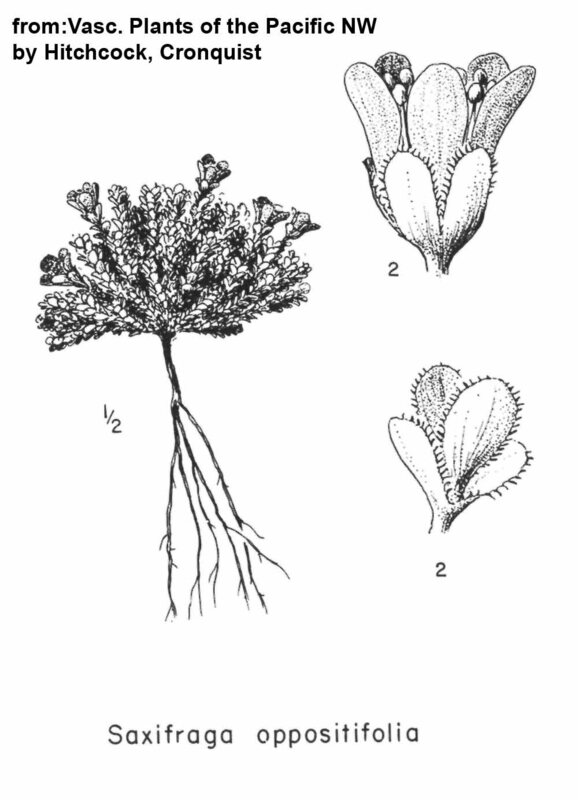 Purple saxifrage can propagate by either self-fertilization or cross-fertilization. The second method is better in the long run, for the major key to long-term survival in the natural world is genetic variation through cross-fertilization, where flowers receive pollen from the flowers of a different plant. Cross-fertilization is normally assisted by insects. The purple flowers of saxifrage are attractive to bumble bees, moths and butterflies in the early part of the flowering season, and to small flies later on. However, in the harsh arctic or alpine climate, insect pollinators may be uncommon or, on cold days, inactive. The female parts of the flower (the stigma) mature first, allowing pollination with pollen from another open flower if insects are available. If cross-pollination does not occur within two to four days, the male flower parts (anthers) lengthen and curve inward to facilitate self-fertilization by the first gust of wind. However, in purple saxifrage, self-pollination produces many fewer seeds, some of which are infertile. No matter what method of fertilization occurs, most seeds are not released from the seed capsule until some snow covers the ground. Only then can the wind carry the seeds easily away over the smooth, frozen surface. Saxifrage often grows in the same environments as white dryad and other low-growing plants that can withstand harsh conditions. These mountainous or tundra areas are very sensitive to trampling, so in order to protect these beautiful and sensitive plants, hikers should stay on trails. 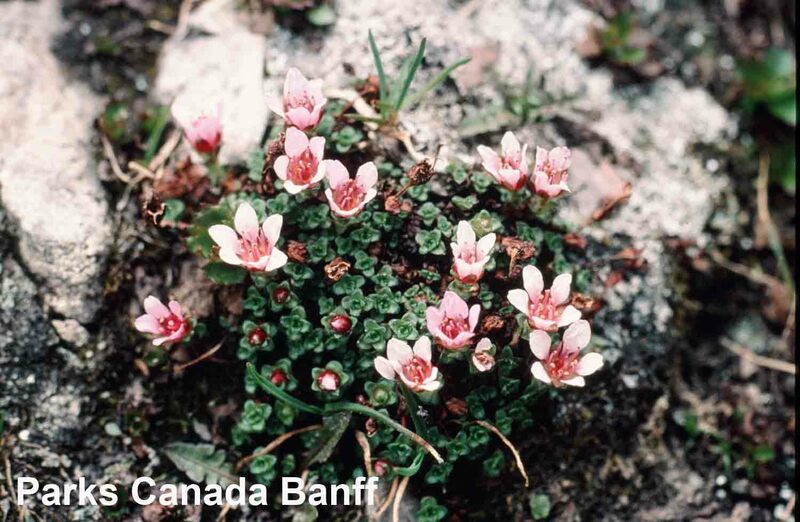 If the saxifrage plant is growing on limestone rock, watch for flecks of calcium carbonate on the leaf tips. The minerals are extruded through a pore called a “hydatode,” usually visible with a hand lens. This species is specifically adapted to conditions of low nitrogen, and can grow in very poor soil. After the snow melts in alpine or arctic regions the flowers of purple saxifrage appear almost as soon as the ground is warm. Once in bloom, the flowers usually last 10 to 14 days. In areas where the snow is quite deep, and the ground does not thaw until late in the summer, purple saxifrage may not be present at all. Flowering abundance in saxifrage is strongly related to the intensity of the sun from July to September of the preceding season. Because much of its floral bud development occurs in the fall of the previous year, the amount of time it is not covered in snow, and can continue developing, has a large impact on the abundance of flowers the next year. Consequently, overall solar radiation is an important factor, because the snow-free period is mainly determined by the amount of sun between July and September. Interestingly, in experiments done by ITEX to simulate climate warming, purple saxifrage did not respond, as many other plants do, by flowering earlier. These experiments suggest that, as the climate gets warmer, saxifrage will not be able to effectively compete with plants that do flower earlier in response to more heat. 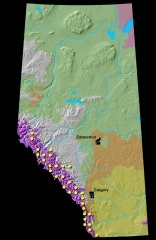 As a result, purple saxifrage populations in the Arctic may be forced to higher altitudes or latitudes, or areas that have been opened up by retreating glaciers. 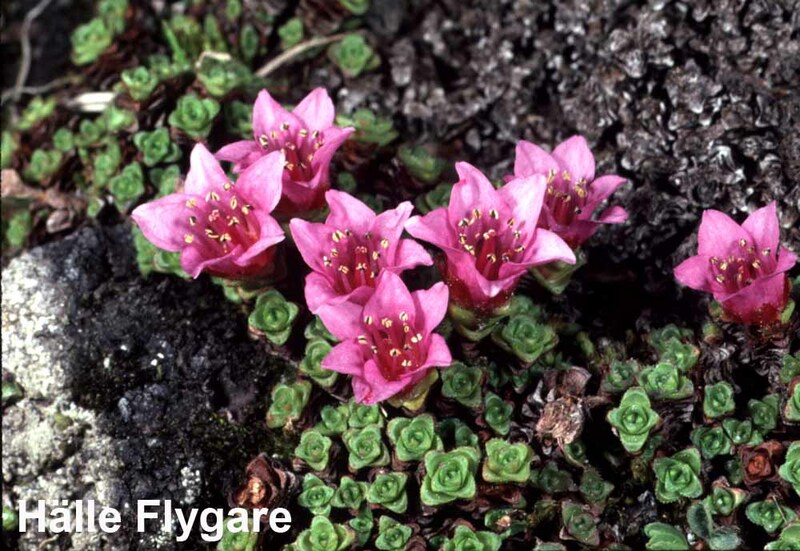 The sweet blossoms of the purple saxifrage are eaten by the Inuit. Gold, green and cream-coloured dyes can be made from this plant. 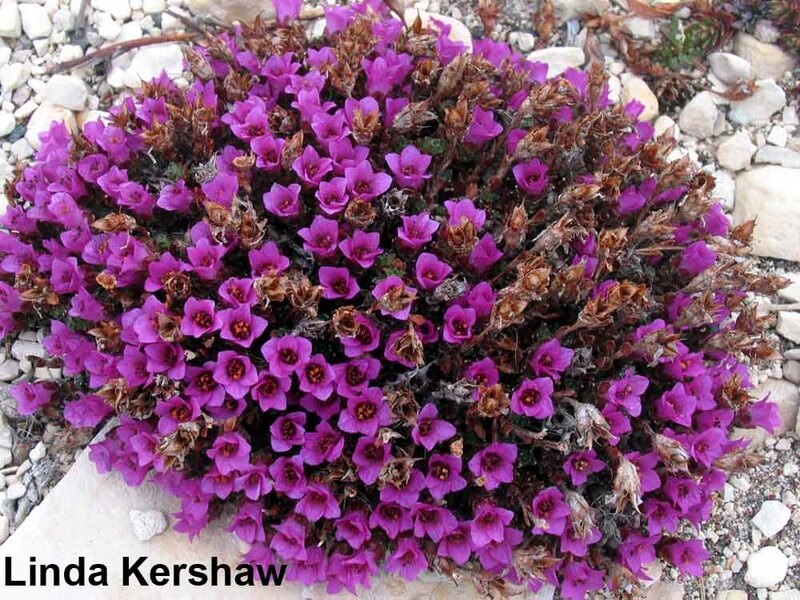 Inuit used purple saxifrage as an important time-keeping function. When the plant is in bloom, the caribou herds are calving. It is possible to grow purple saxifrage in a garden, but the plant is not readily available. Removal of plants from the wild is not ethical, but seed collection may be possible. This saxifrage can be grown in cooler climates as a rock garden species, but it must have conditions that imitate its usual arctic or alpine environments. Soils should be rapidly draining and gravelly, and the exposure should be on a slope facing northeast so direct sun is minimized. Consult your local horticultural rock garden society or native seed/plant growers as a source of seeds. Cultivars exist; if students are reporting on a garden cultivar please note this information under “Comments” on the data form. If treated like a temperate garden plant and given fertilizer, purple saxifrage plants will grow many leaves and weak stems but will not flower (because the plant is adapted to nitrogen-poor soils). Burt, P. 1991. Barrenland Beauties; showy plants of the Arctic coast. Outcrop, Yellowknife, Northwest Territories. Farrow, J. 2001. Up Here Magazine. Outcrop Publishing, Yellowknife, Northwest Territories. Sept. 2001. pg. 36. Kevan, P.G. 1972. Insect pollination of high arctic flowers. Journal of Ecology 60:831-847. Jones, V., and P.W. Richards. 1956. Biological Flora of the British Isles. Journal of Ecology 44:300-316. Molau, U., and P. Mølgaard, eds. 1996. International Tundra Experiment manual. 2d ed. Danish Polar Centre, Copenhagen, Denmark. Porsild, A.E. 1964. Illustrated flora of the Canadian Arctic Archipelago. National Museum of Canada Bulletin 146. Queen’s Printer, Ottawa, Ontario. Porsild, A.E. 1974. Rocky Mountain wildflowers. National Museum of Natural Sciences, Canada. National Museums of Canada, Ottawa, Ontario. Savile, D.B.O. 1972. Arctic adaptations in plants. Canada Department of Agriculture Research Branch Monograph No. 6., Canadian Department of Agriculture, Ottawa, Ontario. Stenström, M., and U. Molau. 1992. Reproductive ecology of Saxifraga oppositifolia: phenology, mating system, and reproductive success. Arctic and Alpine Research 24:337-343. Stenström, M., F. Gugerli, and G.H.R. Henry. 1997. Response of Saxifraga oppositifolia L. To simulated climate change at three contrasting latitudes. Global Change Biology 3: 44-54. Stenström, M. 1998. Controls on reproductive effort and success in Saxifraga oppositifolia an arctic-alpine perennial. Dissertation, Göteborg University, Göteborg, Sweden. Stenström, M., and P. Bergman. 1998. Bumblebees at an alpine site in northern Sweden: temporal development, population size and plant utilization. Ecogeography 21: 306-316. Webb, D.A., and R.J. Gornall, 1989. Saxifrages of Europe. Christopher Helm, London, U.K. (has distribution map). Thanks to Mikael Stenström and Felix Gugerli for editing.